"Deferred Action's Visibility for Legal Nonexistence and Legislatie Power." 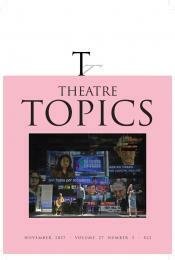 Theatre Topics 27, no. 3 (2017): In Proof. "An Interview with Bren Rapp and Jeff Swearingen of Fun House Theatre and Film." Texas Theatre Journal, 12 (2016). 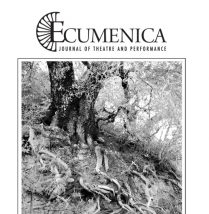 "Embodied Audiences: A Comparison of the Immersive Experiences in Sleep No More and Fuerza Bruta." Texas Theater Journal 8 (2012). "Drug Wars with Gender Reversals: Matthew Paul Olmos' ...so go the ghosts of mexico... part two" HowlRound, 2017. "Performance Review: Inherit the Wind." Ecumenica, 2017. "The Year of Yockey at Kitchen Dog Theater." HowlRound, 2016. 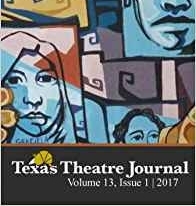 "Performance Review: Deferred Action" Texas Theater Journal 13, 2017. "Performance Review: JONAH" Ecumenica, 2016. Investigative Report, Theater Jones, 2017. "Growing Pains: Dallas, TX" HowlRound, 2016. "Why I Left the Emerald City." HowlRound, 2016. "Taking Children Seriously at Fun House Theatre and Film." 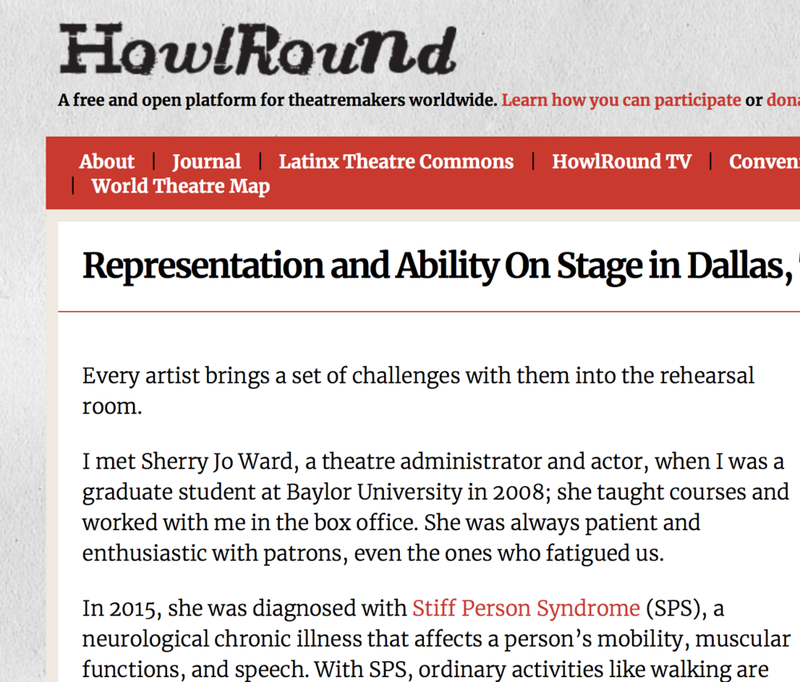 HowlRound, 2015. “Make Theatre Dangerous Again.” Theater Jones, 2017. “Questions on Quanah.” Theater Jones, 2017. “Show Me the Money: On Finances as a Theatre Maker in North Texas.” Theater Jones, 2017. “Rachel Crothers’ Susan and God Revitalized at Theatre Three.” Theater Jones, 2017. “Extinguishing 'Art'?” Theater Jones, 2016. “Whiskey Lullaby: Dave Malloy’s Ghost Quartet.” Theater Jones, 2016. “The Tobyman Cometh: Abel Flores’ Activist Theatre.” Theater Jones, 2016. “Bitter. Sweet! Eric Bogosian’s Best of 100 (Monologues).” Theater Jones, 2016. “Q&A with Len Jenkin on Abraham Zobell’s Home Movie: Final Reel.” Theater Jones, 2014. “Play Time: Dallas Children’s Theatre’s Play in Progress Series” Theater Jones, 2017. "The Necessities: An Interview with Blake Hackler." Theater Jones, 2017. “Examining the Solo Journey in Holy Bone by Dead White Zombies.” Theater Jones, 2017. "Dead White Zombies’ Newest Experiment.”Holy Bone“ Theater Jones, 2017. “Octavio Solis on adapting Don Quixote.” Theater Jones, 2017. ”Br’er Cotton.“An Interview with Tearrance Arvelle Chisholm on Theater Jones, 2017. Straight White Men.”“An Interview with Young Jean Lee and Privilege: Theater Jones, 2017. “An Interview with Douglas Carter Beane and Lewis Flinn on the World Premiere of HOOD." Theater Jones, 2017. 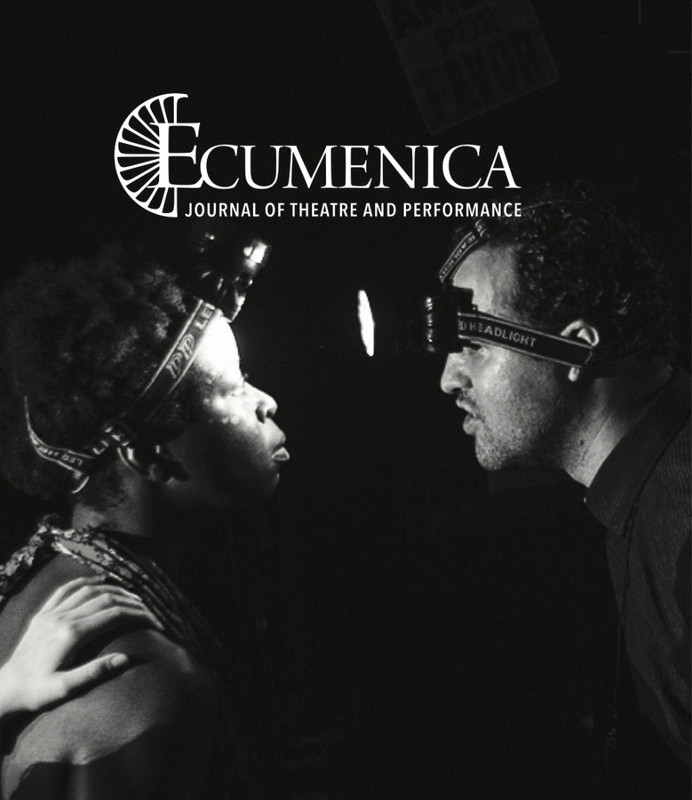 “Festival of Independent Theatres: Interviews with all eight companies, directors, and playwrights.” Theater Jones, 2017. “Interview with Aaron Marks on Deer” Theater Jones, 2017. “Bruce Coleman Quickly Finds Day Light.” Theater Jones, 2016. “The Wild, Wicked, and Wyrd World of Fairy Tales.” Theater Jones, 2016. “Developing New Musicals: An Interview with Kirsten Childs.” Theater Jones, 2016. “PRISM Co.’s Midas: An Interview with Katy Tye.” Theater Jones, 2016. “Self Injurious Behavior: Jessica Cavanagh’s Life in Play.” Theater Jones, 2016. “Iv Amenti’s Deep Remembrance Project Rekindles a Forgotten Legacy” Theater Jones, 2016. “Stuck in a Dream: Justin Locklear’s New Musical.” Theater Jones, 2016. “Barack Obama Had a Farm: Fun House Theater and Film’s Timely Political Work.” Theater Jones, 2016. “Devising Don Quixote with Hip Pocket Theatre’s Lake Simons and John Dyer.” Theater Jones, 2016. “One Minute x Sixty = Dallas.” Theater Jones, 2016. “Now What? Catching up with Jonathan Norton.” Theater Jones, 2016. “Interview with Steve Yockey of NNPN.” Theater Jones, 2016. “Ophelia Underwater: A Feminist Perspective of Hamlet’s Girl.” Theater Jones, 2016. “Deferred Action: An Interview with David Lozano and Lee Trull.” Theater Jones, 2016. “Katherine Owens and Len Jenkin’s Collaboration on JONAH.” Theater Jones, 2016. “Work in Progress: Caridad Svich’s New Play, DeTroya.” Theater Jones, 2016. “Dallas Solo Fest, Interviews with Eight Solo Performance Artists.” Theater Jones, 2016. “Interview with Temple Spirit Playwright, Susan Felder.” Theater Jones, 2016. “Interview with Daniel Sullivan of Prospect High.” Dallas Observer, 2016. “Shut Up and Listen: Developing Devised Theatre with Teens.” Theater Jones, 2016. "Shut Up and Listen: Part Two." Theater Jones, 2016. "Finding Myself in Bed: an interview with Stefany Cambra." Theater Jones, 2016. 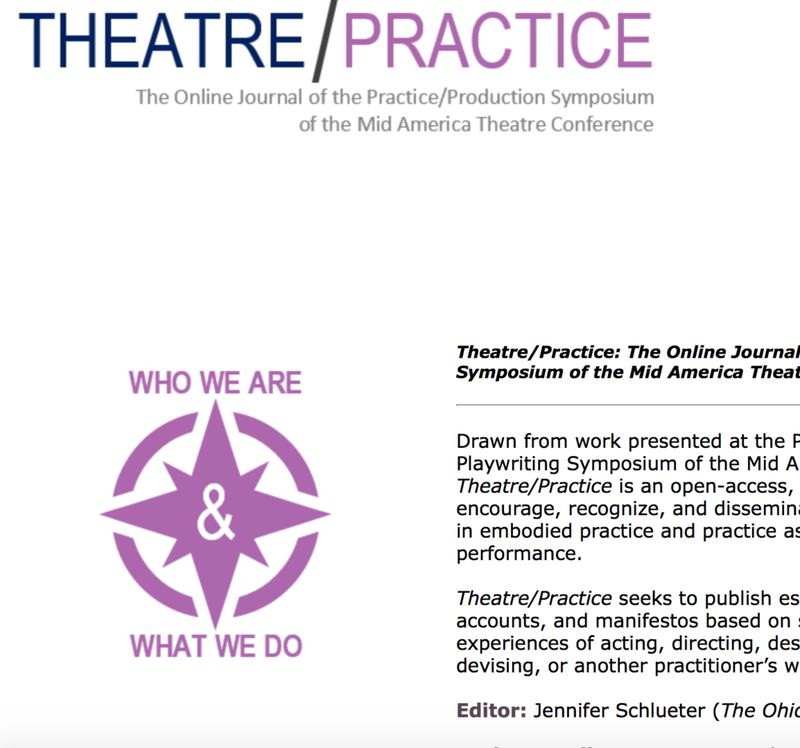 “Who Tells Your Story: Narratives and Gender Disparity.” Theater Jones, 2015. “Transformation through Dance: Junior Players New Initiative.” Theater Jones, 2015. “ Exploring Language: Summer Initiatives with Dallas Children’s Theater and Junior Players.” Theater Jones, 2015. “They Care a Lot: Deborah Jung’s Kids Who Care.” Theater Jones, 2015. “Learning to say YES! at Cara Mia Theatre.” Theater Jones, 2015. “A New Body: An Interview with Sherry Jo Ward.” Theater Jones, 2015. “The Work in Art: Questions of Labor for Teaching Artists.” Theater Jones, 2015. “DaVersify Your Life: An Interview with DaVerse Lounge Creator, Will Richey.” Theater Jones, 2015. "Walking Tall: Amphibian Stage Productions Tad Poles Program." Theater Jones, 2015. “Parental Guidance Suggested: WaterTower Theatre’s Youth Programming.” Theater Jones, 2015. “Teacher/Artist: Sherry Capers.” Theater Jones, 2015.